Polls have closed in India’s first phase of mammoth general elections, with Prime Minister Narendra Modi seeking a second term. The first phase covered an electorate of 142 million voters on Thursday across 20 states and federal territories, who will decide the fate of 91 candidates. Almost 900 million of India’s 1.3 billion people are eligible to vote. It also said voters turned out in large numbers in an eastern district where Maoist rebels were blamed for a bomb attack on Tuesday, which killed a state legislator from Modi’s Hindu nationalist Bharatiya Janata Party (BJP) and four security officials. Raziul Nasir, 53, an accountant at a construction company, said concerns about his children’s future would determine his vote. “All I want is that people who are spreading hatred should be defeated,” Nasir told Al Jazeera. Sachin Tyagi, a mobile phone shop owner from Uttar Pradesh, said Modi has “improved India’s global standing and taken revenge against the enemies of the country”. 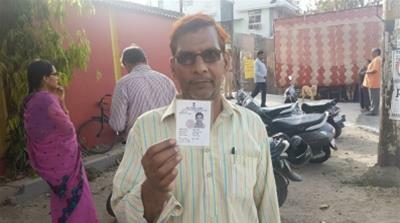 Al Jazeera’s Nadim Asrar, reporting from Noida, a suburb of New Delhi, said voters turned out slowly. “Generally there is brisk voting either in the morning or between 4 and 6 pm,” he said.